"None of us knows what the future holds. But once you've learned how to confront and overcome the unexpected, this lack of knowledge will cease to make you anxious. Tomorrow will no longer be something to fear. And believe me, that's a great feeling"
As a professional, you want to be ready for anything. You'll spend hours, days, even years, perfecting your technique, studying the competition and stepping up to challenges in order to make yourself an all-star. But at some point in your life, regardless of what you do or how far up the ladder you've climbed, you will be thrown a curveball-an unexpected challenge that comes at you quickly and without warning. The kind that forces you to rethink, well, everything. Investment banker Scott R. Singer learned this lesson the hard way. But after a series of career challenges and personal setbacks, he started to develop a new approach to dealing with unforeseen problems by adopting a new attitude toward life. He realized that curveballs are a part of the game and the greatest players know how to knock them out of the park. Step up to the plate: Accept what's happened; don't fight it. Tell others right away, and let them help. Be the batter, not the ball: Don't let your imagination get the best of you. Be a realist, not a pessimist. Keep your eye on the ball: Focus on what you can do instead of worrying about what might happen or what's beyond your control. This fun yet practical book is full of valuable advice and anecdotes that can help anyone avoid striking out at work (or at home) and maybe even turn those surprising challenges into tremendous opportunities. "Baseball has been used by so many motivational speakers and writers as a metaphor for life and business that one hardly expects to be impressed by a new book sporting that rhetorical device. Surprisingly, however, strategic-change expert Scott Singer has managed to put a different spin on the baseball-to-life-and-business comparison that makes How to Hit a Curveball an entertaining and rewarding read. The curveballs to which Singer refers are those unforeseeable and sometimes seemingly devastating occurrences that punctuate nearly everyone's life. Singer presents a process for avoiding striking out and for sometimes smacking one out of the park. One way to do that, according to Singer, is to examine those situations from an untraditional perspective. "The good news is that by using some creativity techniques or following creativity systems, even the most rationally thinking analytical hitter can learn to step outside the batter's box," Singer writes. He offers that recommendation in the "Fifth Inning" of the book. It is divided into nine innings instead of chapters, plus "Spring Training" and "Extra Innings." Singer writes of major curveballs that came his way and the wrong and right ways he handled them, as well as many curveballs that happened to figures in business, entertainment and other walks of life. He drew his inspiration from watching Derek Jeter get fooled by two curveballs before knocking a third one into the stands during a game in 2003." "Everyone in business, from executives in the boardroom to those on the sales floor, needs courage to face our challenging times. Knowing how to hit a curveball is one of the most valuable skills for succeeding in this environment." "If it's raining, you have to learn to love the rain, because it's not going to stop just because you don't like it. Life is all about learning how to hit the curveballs we're thrown, and Scott Singer offers some great insights in how to do just that." "In this chaotic business world, the ability to hit a curveball is what separates the winners from the losers, and Scott Singer knows the game as well as anybody out there." 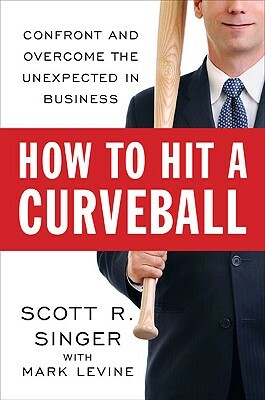 "Exploding the myth that a business career is built on an endless string of shining achievements, Scott Singer cleverly uses the metaphor of baseball to write a strikingly candid guide to navigating life's uncertainties and disappointments. A great-and important-read." "Scott Singer provides a refreshingly practical approach to confronting and overcoming unexpected obstacles on the road to success." "No one gets out of the game of life without a curveball or two coming their way. Whether we swing at it, pull up and step away from home plate, or connect for a home run is a decision we often have to make in a split second. Scott Singer's book shares a play-by-play on how other people made the call for themselves and insights that will help others hit it out of the park."